Clarksville is home to two State of Texas Historic Landmarks, both of which have also been designated historic by the City of Austin. They are the Hezikiah Haskell House and Sweet Home Missionary Baptist Church. The Haskell House, which is located at 1703 Waterston Avenue, stands as a visible reminder of Clarksville’s historic and cultural roots and of the struggles of the former slaves who created Clarksville as an oasis of freedom, community and dignity. Sometime between 1879 and 1887, Peter Tucker and his wife sold their home to Mary and Edwin Smith, who raised their family there. Hezikiah "Kye" Haskell, a Union soldier, Buffalo Soldier and member of the Black Cavalry boarded with the Smiths. In 1881, he married their daughter Catherine. The Smiths subsequently deeded the north half of their homestead to Catherine and moved into a new home on the other half of the lot located across the street from the newly constructed Sweet Home Missionary Baptist Church. Prior to the church’s completion, church members held services in the Haskell House. Kye and Catherine raised their family in the house and the couple added on two additions at the back to accommodate their growing family. Neither addition remains. Following the death of their son, Hezikiah Haskell, Jr., the Haskell family deeded the house to the City of Austin. For several years in the late 1980s, the Haskell House was the site of a popular Senior Lunch Program that was run by the Department of Parks and Recreation. With a combination of grant money from the Texas State Historic Commission and the Austin Convention and Visitors Bureau and the CCDC’s own funds, the Haskell House has become a repository of Clarksville’s history. In addition, the CCDC established the Clarksville Community Garden behind the house. Individuals interested in renting the Haskell House for small meetings and events should contact the CCDC’s property manager, Rose Gabriel, at clarksvillecdc@gmail.com or at (512) 323-6762. Sweet Home Missionary Baptist Church is located at 1725 West 11th Street in the heart of Clarksville. The church was established not long after Clarksville was settled and was immediately the cornerstone of the community and an important part of its social life. Initially, the residents of Clarksville held their prayer and fellowship meetings in the home of Edwin and Mary Smith, which is now known as the Haskell House. In July 1882, church members paid $50 cash to purchase the land where the church now sits. Early services were held at that location under a brush arbor, but eventually, residents had the funds they needed to construct a church building. 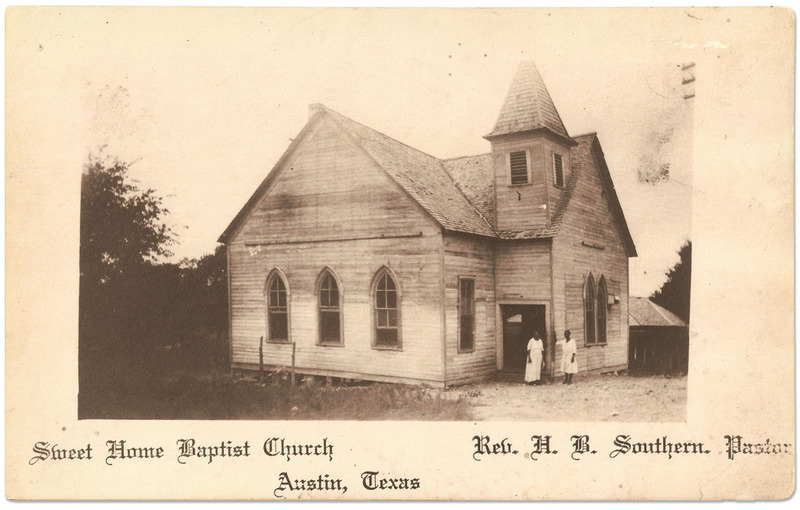 Jacob Fontaine, who began the Gold Dollar, Austin's first Black newspaper, was the church's first minister. The building, which now houses the church, was constructed in 1935. It is actually the third building at that location. Interestingly, the first two churches faced east, but the third, faces north. Sweet Home continues to hold to worship services every Sunday starting at 11AM. The current pastor is Reverend Steve Manning. The church also hosts the popular annual Peace Through Pie event on Dr. Martin Luther King’s birthday.